While it’s always hard to say goodbye to summer, for the chefs at Garfish, autumn represents an ideal opportunity to introduce some warmer flavours and more layered dishes to our menu. We’ve taken fish at its best this season, like octopus and rainbow trout, together with autumnal fruit and vegetables like pears and zucchini flowers. We’ve even got a few surprises in store, including our new unique tuna belly entrée and our first ever dessert incorporating barberry at Crows Nest. This season you’ll discover we’ve maintained the fresher flavours of the summer season and complemented them with a touch of warmth. Hopefully you’ll enjoy the results as much as we’ve enjoyed creating them. This time of year is perfect for baby octopus. The chefs at Manly make the most of our wood roasting oven with this dish, combining the roasted baby octopus with slices of chorizo, and a herb salad dressed in a subtle chilli vinaigrette. It’s warm, yet fresh and a great way to start your meal at Garfish. Our much loved zucchini flowers dish is back! It takes advantage of autumn produce in the zucchinis, which are crisp fried in our beer batter. The blue eyed trevalla, currently in season, we salt ourselves. 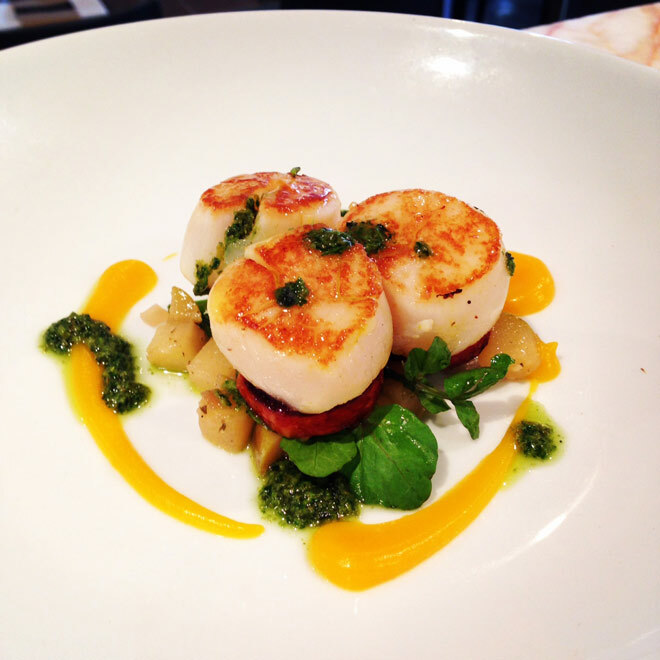 Together with the scallops, sauce vierge and rocket, it’s no wonder this one is back by popular demand. Crisp fried whole baby snapper is combined with our xo sauce, which incorporates chilli, dried shrimps and scallops, and salted cod flavours. The result is a dish for fish lovers who are in the mood for an Asian twist. This dish is autumn at its best. The blend of hot vs cold and Thai influences will have you reminiscing about summer in the light, fresh salad flavours, while enjoying the warmth of the soft shell crab and pork belly. Hervey bay scallops are a regular menu item at Garfish, but we felt it was about time this fresh Australian produce featured on its own. This dedicated scallop dish takes the simple flavours of the scallops and combines it with the earthy flavour of the sea urchin roe butter with satisfying results. A play on the bombe Alaska, this dessert uses waffle instead of sponge. A technically complex dish, we flambé the waffle then layer the hazelnut ice cream, Frangelico syrup, together with a meringue that is torched to caramelise. Add in some raspberry sauce for sweetness and you’ll be in hazelnut heaven. In the mood for chocolate? This dessert is three times dark chocolate so only official chocolate lovers need apply! It’s a bittersweet dish and generously incorporates the bitter flavours of the dark chocolate in the bitter tart, complemented by the smoother texture of the dark mousse. In this entrée, tuna belly makes its first appearance at Garfish. Referred to as ‘toro’ in Japanese, this truly unique dish is served cold and takes advantage of Asian flavours to showcase this fantastic fish. The tuna belly is allowed to marinade for 8 – 12 hours, then grilled until caramelised and rare in the centre. Complemented by a wakame and seaweed salad dressed in soy, mirin and ginger, the tuna belly is firm, flavourful and robust, yet elegant. King prawns are sautéed in a plum and ginger dressing and laid on a salad bed of vermicelli noodles. This entrée has a distinct sweet and sour flavour thanks to the sharpness from the ginger, but we guarantee you’ll be surprised by the blend of subtle flavours. It’s a fresh start to any meal. Every now and then our chefs like to flex their muscles and this dish is all about technique. The rainbow trout is butterflied and boned gently, then roasted in the oven. The clean, delicate flavours of the trout are combined with the sweet, subtle carrot puree and chickpea salsa, which incorporates cumin. It’s a main for our dedicated fish lovers who are keen to experience something new. For the meat lovers, we’ve got this treat in store for autumn. The beef cheeks are cooked long and slow until they fall apart in your mouth, and paired with a selection of simple autumnal roasted vegetables. The byasser paste, which is pounded broadbeans with cumin, chilli, lemon, garlic and coriander, brings an unexpected, memorable flavour to this main. If you’re in the mood to try something new, barberry, a small dried sour fruit, makes its debut in this dessert. The sour tones are matched with the figs, and sweet toffee fig garnish, creating a textured taste that is both sweet and sour. With autumn upon us, it’s time to reintroduce some comfort puddings to our dessert selection. This ginger and golden syrup is just that, but offering a distinct south east Asian twist. The subtle coconut cream and richness of the golden syrup is complemented by the burst of flavour from the ginger and lime for a comforting, yet refreshing end to any meal. Using fresh South Australian baby octopus, which are plump and beautiful at this time of year, the octopus are combined in a salad uniquely designed to lift their flavour. Although simple, fresh herb flavours and capers bring out the best this dish has to offer and it’s a refreshing start to any meal. Incorporating flavours from the Kerala region of India and the Muslim influences to their cuisine, this curry is aromatic and fragrant. It incorporates spices subtly to create a warming dish, yet it is still light enough to complement the lingering summer days that autumn is known for holding on to. A simple dessert that is both light and elegant, it perfects the marriage between orange and chocolate beautifully. Add in the sweetness of honeycomb and the texture of brandy snap, and this dish has been described as ‘a jaffa cake and a maltesar that had a baby!’ We’ll let you decide if this dessert lives up to that description. This dessert is ideal for the cooler autumn evenings, combing a fresh apricot compote with a steamed pudding. Finished with a butterscotch anglaise you’ll be able to relax in the comfort this simple, fresh pudding provides. March is Pear Month, and to celebrate this delicious fruit, Garfish has incorporated a range of pear dishes into our autumn menu. Crows Nest and Kirribill are featuring a selection of entrées, sides and desserts. There’s also a chance to win a dinner for two for qualifying pear loving customers. For more information on our dishes and the competition, click to see our blog post here. We look forward to sharing our range of autumn dishes with you. Available from March onwards at Manly, Kirribilli and Crows Nest.